Today I'm honored to be apart of the CLP Blog Tour for Catching The Bad Guy By Marie Astor. She's here today with an excerpt and an interview!! Janet Maple and Dennis Walker make a good team: she is a top-notch white collar crime investigator, and so is he. Both Janet and Dennis are thrown in for a loop when Janet’s treacherous snake of an ex-boyfriend, Alex Kingsley, is appointed as their new boss, and the case that was supposed to be the highlight of their careers is dismissed for lack of evidence. To make matters worse, Alex is asking Janet to get back together, and the one man she wishes would ask her out sees her as nothing more than a coworker. Janet’s love life soon becomes the least of her worries, as she begins to suspect that Alex’s rekindled interest in her is driven by ulterior motives. She is determined to get to the bottom of things, but she can’t do it alone. Together, Janet and Dennis team up to solve a tangled white collar crime web that leads to powerful politicians and corporate executives. Armed with their keen instincts and skills, Janet and Dennis are bound to succeed. There is just one glitch: both are attracted to each other, and both refuse to admit it. Will Janet and Dennis solve the biggest case of their careers or will their attraction to each other get in the way? 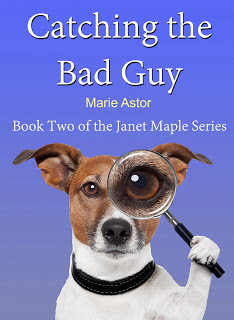 Catching the Bad Guy is book two of the Janet Maple Series, but it can easily be read on its own. “Good. Oh, I almost forgot to tell you, can you believe that he had the nerve to RSVP for the wedding?” Lisa exclaimed. “How?” Janet stared at her. “I … um …,” Janet stammered. In a fit of unchecked optimism, she had selected the “plus one” option when sending her reply to Lisa’s wedding invitation. At the time, she had genuinely thought that she would have a date, and that Dennis Walker would be that date. “There is just one problem. I don’t think that Dennis will agree to be my wedding date. He is seeing somebody,” Janet blurted out. Sure, she wanted to help Lisa, but the thought of asking Dennis Walker out, even for a purely professional reason, literally made her stomach cringe. Office romance, intrigue, corruption – Catching the Bad Guy has it all! Did you have to do a lot of research, if so what was the most interesting thing you found? I watched many episodes of American Green as my research for the book. There are lots of white collar crooks out there and we need good guys like Dennis and Janet to stop them! Do you have a favorite comfort read? Has it helped inspire you? I love Ruth Cardello’s Legacy Series and Blue Grass Brothers Series by Cathleen Brooks. Danielle Steel and Harold Robbins are also among my favorite writers. What is your favorite character trait for Janet? Was she easy to write or hard? I like that while Janet is quiet and reserved, she can always stand up for herself. She is loyal, trustworthy, and smart. I would say that writing her character was both easy and hard at times, but always enjoyable. How did you choose the cover for the book? Janet has a Jack Russell terrier named Baxter. I thought Baxter would be perfect for the cover. Do you have a favorite scene between Janet and Dennis? If so, what? My favorite scene is when Janet and Dennis are listening to a bugged conversation between Finnegan and Muller. You’ll have to read the book to find out why! What makes a great mystery? I think that a combination of romance and mystery makes for a great read. This is the effect is what I was striving for in Catching the Bad Guy, and I hope you’ll enjoy reading it as much as I enjoyed writing it. Marie Astor is a die-hard romantic, which is why she loves writing in the contemporary romance genre. Marie Astor is the author of the Janet Maple romantic suspesne series: To Catch a Bad Guy and Catching the Bad Guy, contemporary romance novels This Tangled Thing Called Love, Lucky Charm, Smitten at First Sight, and a short story collection,A Dress in a Window. Marie is also the author of young adult fantasy adventure novel, Over the Mountain and Back. Marie’s next novel, book three of the Janet Maple Series, is expected to be released in late fall of 2013. In her spare time, Marie enjoys being adventurous out-of-doors. She often gets new story ideas while she is hiking up a mountain or trying to avoid bumping into a tree while skiing. Marie loves hearing from her readers and always answers all of her email personally. Please visit www.marieastor.com to join Marie’s mailing list for updates on contests and new book releases or drop her a line at marie.astor@yahoo.com.